It’s Easter. I was born and raised in Buffalo. I’m Catholic. 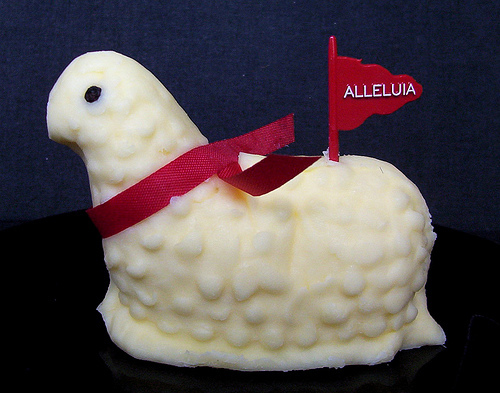 I love me a Malczewski’s Butter Lamb. Q.E.D. I’m fascinated by how a family, a city, a culture, or an era is defined by the food and beverage consumed. So here’s another opportunity to share: what food and drink defines you, your family, your hometown, your politics, religion…whatever? I promise that when you share, I listen and turn your input into content for this blog. I’m just a tad busy with writing projects and a new food adventure. Next > Happy Birthday, E.
My family and I celebrated my local ‘special’ places today – Doughnut Plant and Murray’s Bagels (yes, Philly & DC, I’m bringing these to the next Bagel Off!). And… you just have not lived until you’ve had a creme brûlée or coconut cream doughnut from Doughnut Plant. Growing up, THE defining food of a win on our softball team was an Oreo Cookies and Cream ice cream cone from Denville Dairy. Still my favorite – means home, fun and love.